If you are searching for a new Arduino project to keep you busy over the next couple of weeks you might be interested in this DIY Arduino smartwatch which has been created by Imma Wake. The DIY Arduino smartwatch design includes a 3D printed out casing and is based on the FLORA NeoGeo Watch, but Imma has, taken his design one step further and created his own very unique and custom-built PCB. Watch the video below to learn more about the DIY Arduino smartwatch and how it’s been created and developed through a number of different stages. The Adafruit website explains a little more about the project and the Arduino smartwatch as well as providing links to create your own using the FLORA and its GPS module. 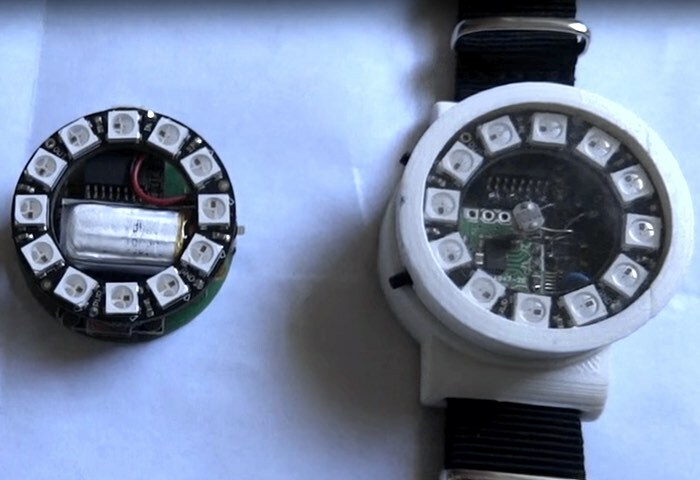 My favorite part of the video is actually seeing the three versions of the watch, from the initial prototype, to the improved board and the final piece with case. I like that he’s included a built-in charger feature and I’m also excited about the possible compass feature and photoresistor. Such a great use of a NeoPixel ring, too—this thing is smokin’! It all started with an ATtiny167 and a DS3231 RTC module. I’m usually not a smartwatch fan because they tend to be bulky, but I feel this one is small enough to be worn by women and youth and has nice geek appeal. I know Immawake was showing some clear glass for the top, but I wonder if something with a little diffusion would look cool? If you are into builds, he’s got a great timelapse in his third update and I recommend you check out the rest of his making videos on his channel. If you enjoyed this article you are sure to enjoy how to build your very own Arduino wind speed meter or anemometer project which is easy to build with basic Arduino skills.